Finally, please check whether your wall fits for wood studs or solid concrete. It can't be used on drywall. UNIVERSAL DESIGN: Fit for most 26"-55" TV, compatible with VESA (mounting hole pattern) 400x400mm/300x400mm/300x300mm/200x300mm/200x200mm/150x150mm/150x200mm/100x200mm/100x100mm(16x16"/12x16"/12x12"/8x12"/8x8"/6x6"/6x8"/4x8"/4x4"). HEAVY DUTY: Made of heavy-gauge steel, strong enough to support screens up to 60lbs. Keeping your TV and families safe. FULL MOTION: +5°/-15° tilt, +/-90° swivel and rotate for maximum viewing flexibility. Enable you to effortlessly turn the screen to get the best viewing angle from anywhere in the room or tilt to reduce glare from light. SAVE SPACE: Retract to just 2.2" from the wall to save space or extend up to 18" to maximize the amount of tilt and rotation, easy to articulate for the best view. 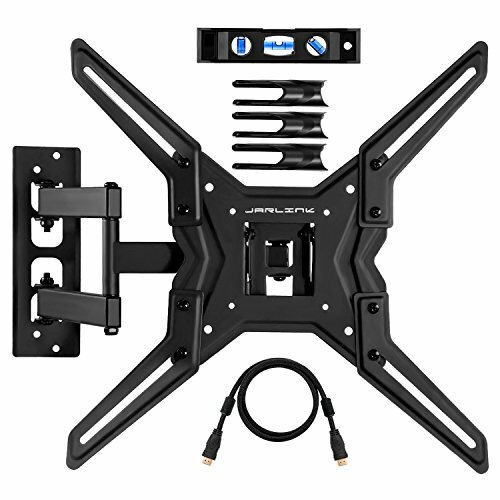 SIMPLE INSTALLION: Easy-to-follow instructions and all needed standard mounting hardware pre-divided (included 6ft HDMI Cable with Dual Ferrite Cores & Bubble Lever & 3 Cable Ties ). 100% Risk-Free Guarantee & 12 Months Warranty & Customer Service availability every day of the week.